After yesterday's indecision about what to work on I spent the evening sat on the sofa adding a few squares to my sock yarn blanket and watching A Series of Unfortunate Events on Netflix (which I adore; I loved How I Met Your Mother and was genuinely sad when I watched the final episode. A Series of Unfortunate Events stars Neil Patrick Harris (who played Barney in How I Met Your Mother) as one of the central chartacters, and I can't help thinking of A Series of Unfortunate Events as The Barney Show. In any case, I love watching A Series of Unfortunate Events!). Today I feel refreshed and have cast on the sock I was procrastinating over. It's going well, and matches my nails beautifully! An extra happy-thing at the minute is the current book I am reading: Bill Bryson's The Road to Little Dribbling. I read my first Bill Bryson book in my teens, and have read many more over the years. The book is a travelogue covering Bryson's trip along the longest straight-line route you can take along the length of Great Britain and I am really enjoying his descriptions of the places he visits. This week hasn't been the best (hence the long delay between posts). We had the death of a close family member last week, and I had an job interview that I didn't get. I'm trying not to dwell on either of these things, but the week hasn't been as bright and sunny as I'd have liked. The week hasn't been all bad though. 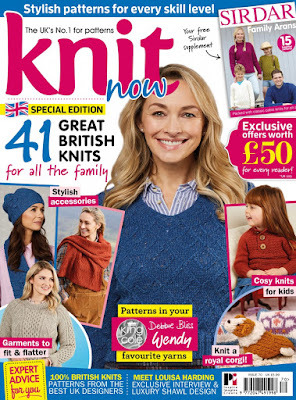 Friends have come to my support, and a lot of my knitting work has been sample knitting with friends in pubs and cafes. This means I have finished the new sample for my Lynda socks (the pattern is currently out for testing, and the pattern will be available from my Ravelry store very soon), and am very near the end of the first sock in the second design of the collection. Lynda socks in my size! I've been working on a new blanket design too, and am now 40 rows from the end of the charted section and am delighted with how it looks. I'm really hoping to get the blanket finished by the end of the weekend (and then for some better weather so I can take some decent photos; it is sleeting as I write this and has been all morning). The socks of doom are off the needles and only need their ends to be darned in before I declare them complete, and I have finally cast on a pair of socks for my husband: I had started knitting him socks in this yarn (a self-striping yarn by Mothy and The Squid) last year, but the second sock came out smaller than the first, so I'm knitting these two at a time in the hope that they will match! The next few weeks may not be the easiest, but I have a few things to be looking forward to, including spending half term with my children, so it's not all doom and gloom. What have you been up to over the past couple of weeks? 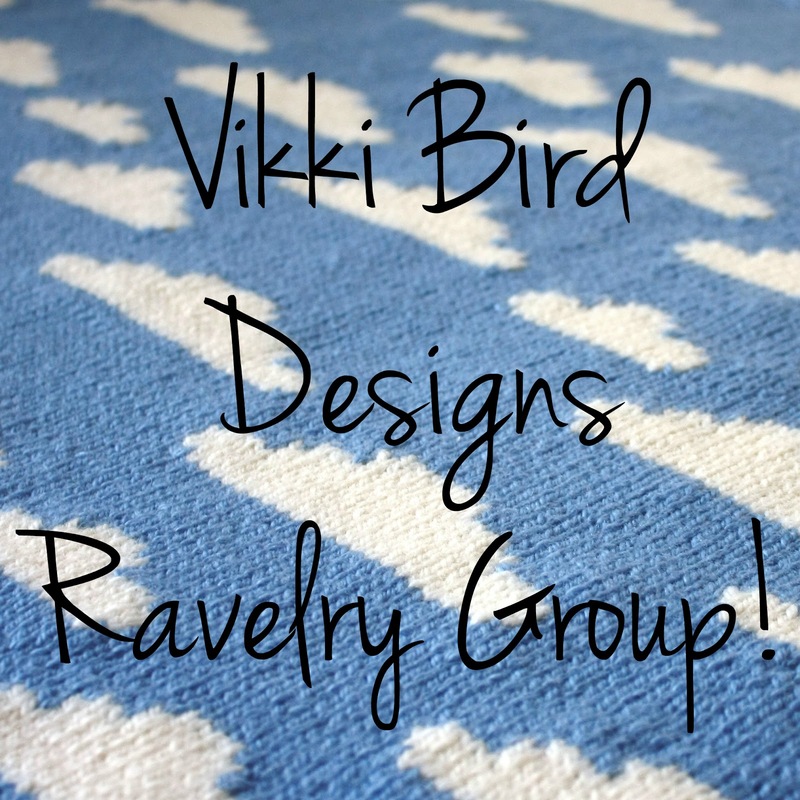 Earlier this week I set up a shiny new Ravelry group for my designs. 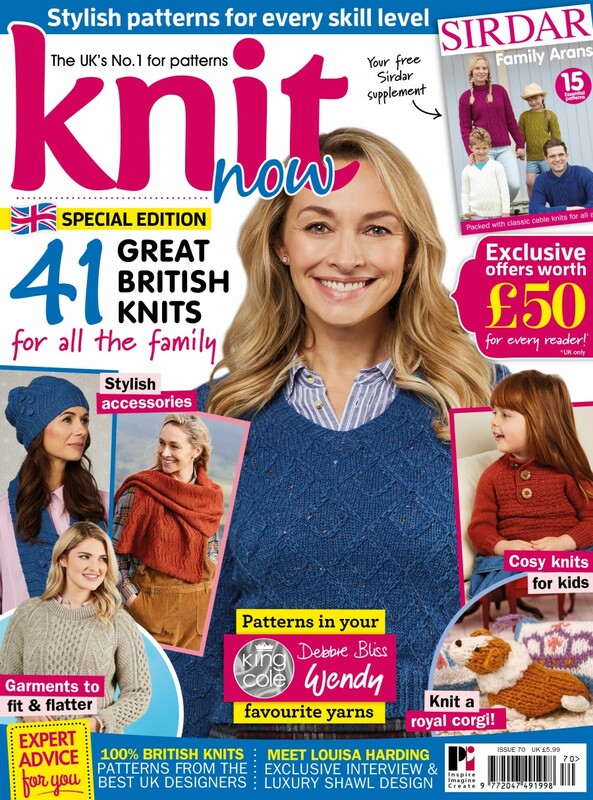 The group is called Vikki Bird Designs and will be hosting all my test knits from this point forward, as well as pattern support, general chatter and knitalongs (I have grand plans for later in the year on this front, which I'm sure I'll tell you all about over the coming months). Joining the group is easy - just click on this link, which will take you straight there (you'll need to be logged into Ravelry for the link to work. 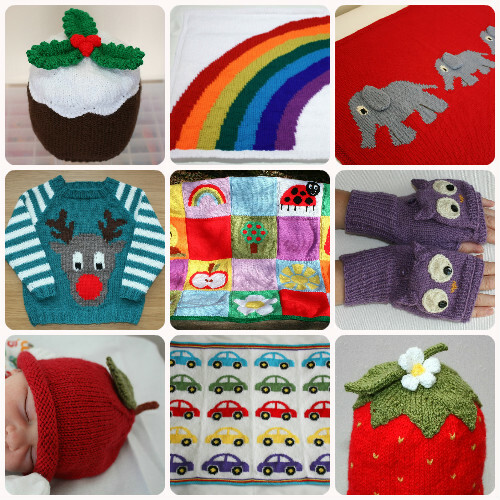 If you're reading this you probably already have an account, if you don't head to Ravelry and set one up; signing up is free and Ravelry is an excellent resource for knitters, crocheters and yarnies). A few of my designs. Head to my Ravelry store to find out more. I'm really hoping that the Ravelry group will allow a two-way conversation between me and anyone who is interested in my designs, as well as allowing friendships to form between like-minded people. So what are you waiting for? Head over there and introduce yourself. The curse of the striped socks strikes again: last night I took them out of their bag to work a stripe on them and one needle had snapped clean off at the join. These socks have been sent to try me - I have cast them on twice, used two sets of needles on them, and I dug a hole in my finger with the needles. They are trying their hardest not to be finished. I'm certain this pair of needles is one that I have fixed before (with super glue) when the cable slipped out of its casing. But they are now destined for the bin, and that might be it for me and wooden sock needles - I need my needles to stand up to whatever it is I'm throwing at them. Last night I ordered two new sets of needles, both Addis, 2mm with 100cm cables. They're what I've been happily (enough) using on another pair of socks: they don't break while I'm using them and I can consistently get gauge with them (though the cable joins do seem to adopt rather a right angle with use; it's possible that's just my knitting style though). I didn't even add any sock yarn to my order! And I will finish these socks. Yes, apparently the needles were broken earlier in the week and I didn't notice! One of my goals for 2017 is to read for at least 15 minutes a day. And it's working! I am actually getting through a few books! Here's what I've been reading in January. The story starts with newly-engaged Rosie finding out that she's unexpectedly pregnant. Her war-hero fiance (Steven) hears news from Africa that the sister of two children who died while he was trying to protect them is also pregnant, and the couple plan a trip to Africa. Obviously things don't go quite to plan, especially when you add in Steven's aloof family. The action in this book splits itself between Africa and Derbyshire, and while you have to suspend your disbelief for some of it, I was caught up in it and found it a very enjoyable read, especially over Christmas. This book is the third in the Rosie Hopkins' Sweet Shop series, and while I have read the second (Christmas at Rosie Hopkins' Sweet Shop; over Christmas 2015), I don't think that matters on this occasion - the book has a handy summary of what happened in the previous stories, so you can start this one with all the background in place, and it is an easy read. I definitely plan on reading more of Jenny Colgan's books when I fancy reading something light, but well-written. When Hitler Stole Pink Rabbit is a novel based on Judith Kerr's experiences as a Jewish child in the 1930s and her life as a refugee. Anna is a pretty typical nine year old girl living in Germany when her family are forced to flee and live as refugees, first in Switzerland, then Paris and finally England as her father is a high-profile anti-goverment writer with a price on his head as Hitler comes to power. This book is one that I had been meaning to read for a long time, but may never have actually got round to if a friend hadn't sent me a copy for Christmas. I have read many of Judith Kerr's books for children, including the Mog series and The Crocodile Under the Bed, but hadn't read any of her novels. I found the book very easy to read, and wanted to know what happened to the family, and their wider community; there is peril, and a lot of laughter mixed in with pictures of poverty. Highly recommended. Five Give Up The Booze is one of a series of Enid Blyton parodies written for the Christmas gift market. The Five in the title are the Famous Five, whose childhoods were depicted by Enid Blyton as they went on adventures and drank ginger beer and are now grown up and struggling with modern life. These characters are firm favourites from my childhood, and the book didn't disappoint; in this instalment the Five give up alcohol for January. Very light, very enjoyable. My only criticism is that the pictures (which hark back to the original books) are in no particularly order, and don't often faintly relate to the section of text they are placed in. I have another to read, and will be looking out for the others when I fancy something quick to read.